Dragons, fierce creatures of myth, fable, and legend, have been the subject of stories for thousands of years in cultures all over the world. 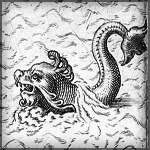 Dragons are usually depicted as large reptiles, although descriptions range considerably. Dragons may symbolize evil, defiance, nature, power, strength, creativity, or change. Enjoy these stories of dragons and let your imagination soar! Four brothers set out into the world to earn their fortunes. Three soldiers desert a king’s army and end up enthralled to a dragon. A prince wins the flower queen’s daughter. A young man is betrayed by his jealous older brother and left in the forest. He uses trickery to get out of his trouble, and still more trickery in order to make his way in life. When the king hears of his reputation he is called to the castle and given three tasks to complete. A Japanese warrior defends the Dragon King by killing his enemy, the monster centipede. In gratitude the Dragon King gives the warrior several presents, including a bag of rice that never runs out, and he comes to be known as My Lord Bag of Rice. Billy Beg and His Bull encounter many adventures in their escape from the king’s new queen. A prince overcomes a dragon and rescues his brothers.